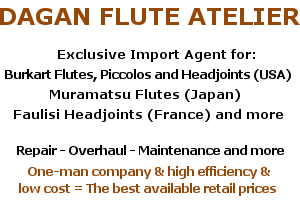 WHAT ARE MURAMATSU VINTAGE FLUTES? As an authorized (1988) Muramatsu technician/dealer/lover/fanatic, I prefer those that were made in the 80’s and 90’s (serial numbers up to ca. 55000). – A never-failing-mechanism & pads that hardly have to be fixed or adjusted! – Traditional Muramatsu felt pads that last 4-5 times longer than any modern-style; patented; exorbitantly expensive pads! (Such as the various versions of M-pads, Straubinger, Pisoni S2, Gold-pads and others). Luckily, I still own some Brand-new Vintage EX, GX, DN, SR, PT-P models, and sell them to connoisseurs. Regretfully, it’s the last stock of Brand-New Vintage Muramatsu Flutes. No Brand-New Vintage Flutes will ever be available anymore, worldwide! (Unless somewhere hidden). It’s like the Saxophone Selmer mark VI phenomenon, if you are familiar with the history of Selmer. I also buy pre-owned (1), authentically overhaul (2) and sell used Muramatsu Vintage Models so if you have one or want one, please contact. (1) Only authentically repaired/overhauled in the past or (preferably) never repaired at all. (2) With the original Muramatsu spare-parts and technique as originally the model was made. P.S. In case you have another opinion about the above I fully respect yours, although firmly stand behind mine.